At a special event today, Oculus VR revealed the first consumer version of its Oculus Rift headset. 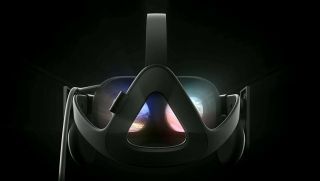 The consumer model is "really lightweight," says Oculus. "You're going to put it on like a baseball cap." It's also said to "better accommodate glasses," which has been a problem for me when trying the prototypes. The Rift features a custom display and optics—which Oculus has been working on for years—and a tracking sensor on a stand, which looks like the one that leaked the other day. We learned earlier that the Rift will include integrated headphones, but now we also know that they're removable, so you can also use your own headset. Oculus also announced that the Rift will ship with a wireless Xbox One controller. Later, founder Palmer Luckey took the stage to announce Oculus' own controller, Oculus Touch. We've since learned that Touch is coming in the first half of 2016, shortly after the Oculus Rift is available, and will be sold separately.